Life of a Catholic Librarian: Summer book club news, & exciting new projects! Happy Monday everybody! Despite it being a Monday morning, I am in an inordinately good mood. Why is that, you ask? Well, I've been doing a lot of project planning, both personal and professional (and even a mixture thereof!) and I'm very excited about everything. Isn't it a wonderful feeling to experience a creative boost of energy? I just love when that happens. Ok, so! Thing #1 is that I was thinking about summer reading and the Catholic Book Club. Next week is our scheduled June installment, which is Praying in Rome: Reflections on the Conclave and Electing Pope Francis by Cardinal Timothy Dolan. This is a quick and light read, and at $1.99 for Kindle, you can't go wrong. I read this before my trip, and have all my notes ready to go for the review post on June 24th. Definitely join me then! After that, I have two more books scheduled in the Book Club queue, but then do you want to know what happened? Of course you do, that's why you're still reading my excited gibberish. ;-) Ok, so, a happy God thing happened. Godincidence? Is that what such a phenomena is called? If it's not, that's what it *should* be called. At any rate, I saw a summer book club announcement over at CatholicMom.com. I mean, doesn't that just have a lovely ring to it, summer book club? I think it's my deep seated librarian sensibilities. I adore seasonal projects, and plus, it's the summer, so YOU SHOULD BE READING. By the beach or pool, if you'd like, but the summer is a FANTASTIC time to start a new book. The pace is slower, you have longer evening light, go sit on your porch with a book. ;-) But I digress, as I am so wont to do. Catholic Mom, summer book club, Godincidence, back on track, check! So I saw that announcement, and it immediately perked my interest because not only do I love book clubs, but I own the book already. In fact, I was randomly drawn to win a copy from the darling Deacon Tom and his lovely wife Dee over at the Catholic Vitamins podcast. "I really need to read this, I could benefit from some deeper spiritual reading right now." Then I admired the cover and tucked it onto my book shelf, with full intentions to read it. At some point. But you know how those things go. So when I saw the Unleashed Book Club announcement, I slipped my copy off the shelf. And you see the subtitle there? "How to Receive Everything the Holy Spirit Wants to Give You." Remember my joyfully teary video from last week following the CNMC? When I talked about the Holy Spirit? Yep, it all comes together right here. 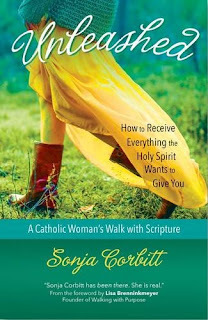 So I'm going to be reading this book and participating in the book club over at CatholicMom.com. With books like this, I sometimes don't include them in my own Catholic Book Club because it's too much for me to get through in a single month. The setup over at Catholic Mom is perfect. A chapter a week for eight weeks, and week 1 was just posted. That gives a participant time to savor each chapter and reflect on it fully. I can see that the comments section is hopping, and I'm looking forward to learning from everybody else who is interacting with these posts. I'm super excited about this, and thus Unleashed is going to be my spiritual reading for the rest of June and July. You'll see that I have this noted in the Catholic Book Club Reading List sidebar on the right side of the blog. When the Unleashed Book Club is complete, I may post my own review over here, we'll see. But in August, we'll pick back up with traditional Catholic Book Club posts over here on a Catholic YA title that I'm anxiously anticipating. So, do you want to jump on board? I'd love it if you would, and please let me know if you decide to participate by leaving a comment. Unleashed is available for instant download via Kindle, or in paperback form both from Amazon (so if you have Prime, 2 day shipping!) 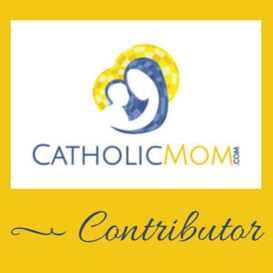 and Ave Maria Press (if you read the initial announcement post and author interview over at Catholic Mom, there is a coupon code!). In regards to aforementioned new projects...there are several, and they all involve writing. A few are work related (translation: boring ;-)) but a few are of extreme personal meaning to me and are tied into my writing responsibilities as a faculty librarian. Or at least, I'm hoping to make a case that they are in fact tied together. :) At any rate, I love to write. And for the first time in a long time, I feel inspired to try new venues for my writing. I'm being a little vague, yes I know, but that is by design. ;-) I will keep you posted when I have concrete things to report. Right now, everything is still in the planning stages and still very much a dream. You will know as soon as I know anything for realz! All right, I have rambled long enough for today, but I do so enjoy doing that with you all. Are any of you interested in the Unleashed Book Club? What are your summer project plans, anything new and exciting that you'd like to report? Please do chime in and let me know!